This article is about the glacial feature. For other uses, see Icecap (disambiguation). An ice cap is a mass of ice that covers less than 50,000 km2 of land area (usually covering a highland area). Larger ice masses covering more than 50,000 km2 are termed ice sheets. Ice caps are not constrained by topographical features (i.e., they will lie over the top of mountains). By contrast, ice masses of similar size that are constrained by topographical features are known as ice fields. The dome of an ice cap is usually centred on the highest point of a massif. Ice flows away from this high point (the ice divide) towards the ice cap's periphery. Ice caps have significant effects on the geomorphology of the area that they occupy. Plastic moulding, gouging and other glacial erosional features become present upon the glacier's retreat. Many lakes, such as the Great Lakes in North America, as well as numerous valleys have been formed by glacial action over hundreds of thousands of years. On Earth, there are about 30 million km3 of total ice mass. The average temperature of an ice mass ranges between −20 °C and −30 °C. The core of an ice cap exhibits a constant temperature that ranges between −15 °C and −20 °C. 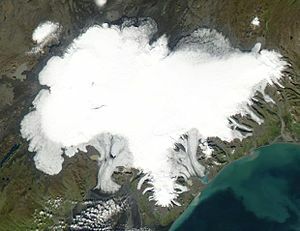 A high-latitude region covered in ice, though strictly not an ice cap (since they exceed the maximum area specified in the definition above), are called polar ice caps; the usage of this designation is widespread in the mass media and arguably recognized by experts.Vatnajökull is an example of an ice cap in Iceland. ^ a b Benn, Douglas; David Evans (1998). Glaciers and Glaciation. London: Arnold. ISBN 0-340-58431-9. ^ a b Greve, R.; Blatter, H. (2009). Dynamics of Ice Sheets and Glaciers. Springer. doi:10.1007/978-3-642-03415-2. ISBN 978-3-642-03414-5. ^ "TIME Magazine Online: Arctic Ice Explorers". CNN. 2009-03-11. Retrieved 2010-05-04. ^ Flowers, Gwenn E.; Shawn J. Marshall; Helgi Bjŏrnsson; Garry K. C. Clarke (2005). "Sensitivity of Vatnajŏkull ice cap hydrology and dynamics to climate warming over the next 2 centuries" (PDF). Journal of Geophysical Research. 110: F02011. Bibcode:2005JGRF..11002011F. doi:10.1029/2004JF000200. Retrieved 2007-05-31.